Students are invited to join company representatives and former student interns to learn about finding and landing an internship. 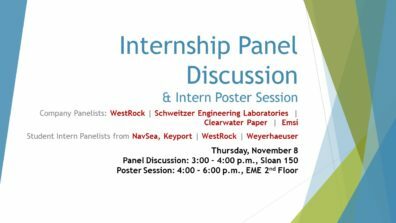 The Panel will consist of representatives from Clearwater Paper, WestRock, Schweitzer Engineering Laboratories, and EMSI, along with student interns from NAVSEA, WestRock and Weyerhaeuser. The panel discussion will be followed by a poster session where students who completed an internship last summer will present a poster on their experience.